Greeting the nation from his front porch in Canton, nursing his frail wife, sporting scarlet carnations from a foe, soft-peddling his views, the dapper little William McKinley seemed like the quintessential Victorian. The impression deepened when assassin Leon Czolgosz from Cleveland froze him in time and Teddy Roosevelt rough-rode into the Progressive era. But McKinley launched what became known as the American Century. He helped make a former colony a colonizer and the world’s biggest manufacturer. He planned the Panama Canal and the Open Door policy toward China. He promoted labor rights, mediation and arbitration. He created the White House’s war room, press briefings and press receptions. McKinley broadened a Republican base that mostly dominated until 1932. While he quaintly campaigned from his porch, innovative backers paid the way of an estimated 750,000 visitors from around the country. They also used early polls and movies. Supporters called him the Idol of Ohio. Critics called him Wobbly Willie. Republican boss Tom Platt of New York thought the Ohioan “much too amiable and much too impressionable.” Joseph Cannon, future House speaker, said McKinley kept his ear so close to the ground, grasshoppers jumped inside. McKinley avoided serious scandals. He refused speaking fees and corporate jobs while in Congress. He shunned endorsements that required patronage. Some editorial cartoonists drew him as a puppet of Cleveland ally Marcus Alonzo Hanna, dubbed “Marcus Aurelius” or “Dollar Mark.” In 1893, when the economy tumbled, Hanna and fellow tycoons paid off a $130,000 debt that McKinley had incurred backing a friend’s business. Critics sneered, but most of the public sympathized. 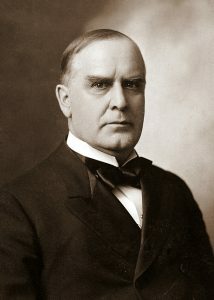 McKinley was the sixth elected Republican president in a row born a Buckeye. He was born Jan. 29, 1843, the seventh of eight children in a Scotch-Irish, Whig, abolitionist family. He was raised in the northeastern Ohio towns of Niles, Poland and Canton. His father, William Sr., managed and co-owned an iron foundry. Historians say McKinley grew up to promote the local kind of capitalism: small, independent, businesses with good products, good wages and good returns. He went to a Methodist academy and was baptized. He entered Allegheny College in Meadville, Pa., but soon came home ill and grew depressed. He clerked for the postal service and taught school. In peacetime, McKinley spent a year at Albany Law School and started a practice in Canton. Soon he became a Mason, local YMCA president and Stark County Republican county chairman. He was elected county prosecutor in 1869 and narrowly defeated in 1871. He fell in love with a rare female bank cashier: the slim, blue-eyed, curly-haired Ida Saxton, whose leading family owned the bank and the Repository, a Republican-minded newspaper. The couple married in 1871, when she was 23 and he nearly 28, old for newlyweds back then. They rented two modest houses in turn from her family before finally buying one in 1900. The other is now called the Saxton-McKinley House, part of the National First Ladies Historic Site. The couple’s two girls died young. The grieving mother developed seizures and became an invalid for the rest of her life. William took to reading the Bible and playing cars with her for a couple hours per day. In 1876, miners were arrested for rioting in nearby Massillon. McKinley defended them for free. Just one was convicted. The lawyer’s success turned a foe, mine owner Hanna, into a supporter. That year, at age 34, McKinley won election to Congress. Over the next 14 years, Democrats tried to gerrymander him out of office whenever they could. He lost in 1882 but retook the seat in 1884. One opponent always gave him a carnation to wear for their debates. McKinley wore the seemingly lucky flower for life. The congressman championed tariffs to boost domestic goods and wages. He backed the Interstate Commerce Act and the Sherman Antitrust Act. On one of the era’s hottest issues, he supported “sound money” standards of gold and sometimes silver too. In 1888, he was wooed for the presidential nomination but kept a pledge to support Ohio Senator John Sherman. In 1890, he narrowly lost a bid for speaker of the House but began to chair the powerful Ways and Means Committee. That year, he passed the McKinley Tariff, raising rates on most imports to a record 48 percent, but conceding some breaks for special interests. The Democrats gerrymandered his seat again, and phony peddlers offered goods at daunting prices blamed on tariffs. He lost by 300 votes, but won the governorship in 1891 and again in 1893. He persuaded the Statehouse to tax railroads, telegraphs, telephone lines and foreign corporations. He won a labor arbitration board and fines for bosses who fired unionists. He promoted workplace safety, led a relief drive for starving miners and successfully mediated a railroad strike. He also sent the National Guard to quell a violent strike. McKinley reportedly waved to Ida every morning from the spot outside the Statehouse where his statue now stands, then waved again every afternoon from a window. She tried to attend official events but often had fits during them. He calmly covered her face with a handkerchief or carried her from the room. In 1892, he refused presidential consideration again but finished third at the convention anyway. In 1894, he stumped in 300 cities for Republicans. The next year, he declined renomination as governor and took quiet aim at the White House. By tradition, he stayed home during the 1896 convention. He won on the first ballot, with 661 1⁄2 votes to 84 1⁄2 for his nearest rival. The vice-presidential nominee was Garret Hobart, head of the New Jersey state senate. As Democratic incumbent Grover Cleveland prepared to step down, William Jennings Bryan swept the Democratic and Populist nominations with his “cross of gold” demand for free and unlimited currency. Then he stumped over 18,000 miles and seemed to surge. Hanna billed him as an “advance agent of prosperity.” The tycoon deployed some 1,400 speakers and 200 million pamphlets in a nation of just 14 million voters. He raised a war chest estimated anywhere from $3.5 million to $10 million, which would be worth about $269 million in 2014 dollars. The bounty included $250,000 from John D. Rockefeller, Hanna’s schoolmate at Cleveland’s Central High School. Bryan’s polemics—rural, nativist, fundamentalist and classist—eventually turned many previously Democratic workers in the swelling cities toward moderate, inclusive McKinley. The Republican got 271 electoral votes to 176 and 51.0% of the popular votes—the first presidential majority in 24 years. Taking office on March 4, McKinley called a special session of Congress and won the highest tariffs yet. Soon the economy began to surge. In 1898, for the first time, the U.S. would export more manufactured goods than it imported. Meanwhile, McKinley stripped civil service protections from about 4,000 jobs. His first cabinet picks were weak, and six of the eight fell out during the first term. But his choice of an aging John Sherman for secretary of state opened up a Senate seat for Hanna. The president appointed some black officials and pushed recruitment and promotion of black troops, but did little else to stop the nation’s rising discrimination. He visited the Tuskegee Institute and Confederate memorials. He denounced lynching but did little to stop it. McKinley telegraphed, telephoned and traveled widely. He became the first president to visit California. Death stopped his plans to be the first abroad, but he’d already crossed borders in other ways. He helped pass the Hague Convention on warfare and create the Hague’s Permanent Court of Arbitration. He helped crush China’s Boxer Rebellion and launch the Open Door policy to help U.S. exports there. He sent Marines to Nicaragua to defend Americans’ property. Then the Maine sank off Havana, and Navy officials blamed a probably innocent Spain. McKinley led what Secretary of State John Hay of Cleveland famously called “a splendid little war.” The president directed the troops in some detail. He won wartime taxes on high inheritances and more. He also persuaded Congress to annex Hawaii. The war took just four months. Spain agreed to free Cuba and cede Puerto Rico, Guam and the Philippines to the U.S. The Senate narrowly accepted the territories, and U.S. troops spent four years quelling Filipino insurgents. Unlike most predecessors, McKinley stumped for congressional candidates in mid-term. The Republicans kept control of both houses. He sought treaties on dual standards for currency, but gold strikes were undercutting silver. In 1900, he signed the Gold Standard Actwith a gold pen. At the 1900 Republican convention, the only question was who’d replace the late Hobart as vice president. Hanna lobbied hard against Roosevelt, but McKinley refused to interfere, and the New Yorker prevailed. Bryan was renominated by the Democrats and stumped widely again, as did Roosevelt. McKinley returned to his porch, and Hanna raised more millions. The incumbent’s victory was bigger than before: 292 to 155 in electoral votes; 51.7 percent to 45.5 percent in popular votes. During his second term, he planned a commerce and labor department. He also told an aide, “The trust question has got to be taken up in earnest, and soon.” He’d already called trusts “dangerous conspiracies… obnoxious to common law and the public welfare.” But his attorneys said they lacked power against the trusts, and he proposed no stronger laws. Despite rising assassinations overseas, he insisted on shaking hands with strangers at the exposition the next day. “No one would wish to hurt me,” he said. A young girl reportedly asked for his lucky carnation. He complied. Then Czolgosz approached to act for anarchy. McKinley offered a hand. A bullet flew deflected off his coat button. Another lodged in his stomach. McKinley languished for eight days at a nearby house. Doctors spoke optimistically but missed the bullet and a case of gangrene. On the 13th, he said, “It is useless, gentlemen. I think we ought to have prayer.” Ida cried and begged to go with him “We are all going; we are all going,” he replied. “God’s will be done, not ours.” He died early the next day. Roosevelt took the oath and said, “It shall be my aim to continue absolutely unbroken the policy of President McKinley.” Czolgosz was promptly tried and electrocuted. McKinley grew even more popular in death. Mourners put his likeness on the $500 bill, his name on the continent’s highest mountain and his coffin in a new memorial in Canton. They also made Ohio’s state flower the scarlet carnation. William McKinley by Kevin Phillips, 2003, Henry Holt & Co. The Presidency of William McKinley by Lewis L. Gould, 1980, University Press of Kansas. William McKinley and His America by H. Wayne Morgan, 2003, Kent State University Press. William McKinley and Our America by Richard L. McElroy, 1996, Stark County Historical Society. McKinley Presidential Library and Museum, 800 McKinley Monument Dr. NW, Canton, OH 44708, 330-455-7043, www.mckinleymuseum.org. National First Ladies’ Library, 331 Market Ave. S., Canton, OH 44702, 330-452-0876, www.firstladies.org. Grant Segall has spent 39 years on daily newspapers, including 30 at The Plain Dealer. He currently writes the My Cleveland column and covers the Berea school district for the PD and Sun News. He has shared in three national prizes and won several state and regional ones. Segall has freelanced for Time, The Washington Post, and many other publications. His John D. Rockefeller: Anointed With Oil has been published by Oxford University Press and by houses in Korea and China. His short stories have been published in college journals, including Whiskey Island at Cleveland State, and in independent zines. He lives in Shaker Heights and has three sons.